Dabul, from John Ogilby's Asia, the first part, being an accurate description of Persia, the vast empire of the great Mogol, and other parts of India, etc. bl.uk > Online Gallery Home	> Online exhibitions	> Asia, Pacific and Africa Collections	> Dabul, from John Ogilby's Asia, the first part, being an accurate description of Persia, the vast empire of the great Mogol, and other parts of India, etc. Egraving by John Ogilby (fl.1673) of Dabhol in the Konkan region of Maharashtra, dated 1673. Dhabol was of considerable importance in the 14th, 15th and 16th centuries. It was the principal port in the southern Konkan, carrying on trade with Cambay, Malabar, the Red Sea and the Persian Gulf, and was the capital of a province of the Bijapur kingdom under Yusuf Adil Shah. John Ogilby was 'Cosmographer, Geographic Printer, and Master of His Majesty's revels in the Kingdom of Ireland' to Charles II. 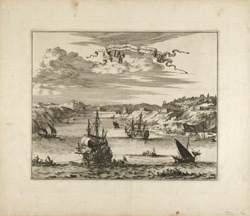 This image, re-engraved from an original Dutch print; hence the Dutch pennant inscription at the top, forms one of the illustrations to Ogilby's 'Asia, the first part, being an accurate description of Persia, the vast empire of the great Mogol, and other parts of India...', published in 1673. Ogilby's description of Dhabol reads, "Four Gau, or twelve Leagues from Chipolone, down the River Helewacko, lies the City Dabul, or Dabrul, anciently very famous, but of late much ruin'd by the Wars, and decreas'd in Trade...It lies open onely on the South-side which fronts the Water, where are two Batteries planted with four Iron Guns. On the Mountains are several decay'd Fortresses, and an ancient Castle, but without any Guns or Garrison. On the Northern Point, where the Bay begins, stands a little Wood, which at a distance appears like a Fort, and below this Wood, near the Water, is a white Temple, or Pagode; as also another on the South Point, on the declining Mountain, besides several other Temples and Stately Edifices."